The Cavaliers, Gene Barbour & The Cavaliers, Men of Distinction (NC), and Finally Harry’s Band. Don't call what Harry's Band does "beach music," unless you want a real argument -- the group, which has been a going concern one way or another since the 1960s, still evokes that kind of passion, especially from people in the Carolinas. 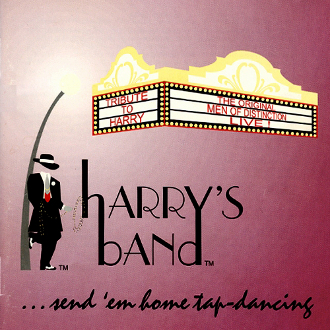 Harry's Band were a serious musical institution in the Southeast, especially in North Carolina, with a history stretching back 45 years. They got their start in 1963 when a group of teenage would-be musicians from Dunn, NC (a town that had already produced one rock & roll legend,Link Wray), approached Harry Driver, a local elder statesman in music already in his thirties, and the uncle of one of the boys. Driver knew his way around the music business, especially club owners and promoters. The band, originally known as the Cavaliers, coalesced around Donald Hobson, Charlie Aycock, Walt Jones, Tommy Ralph, and Billy Wellons. They later acquired a lead singer, and the band became Gene Barbour & the Cavaliers, who ended up, in short order, opening shows in the Carolinas by the likes of Stevie Wonder, the Impressions, Dionne Warwick, Smokey Robinson & the Miracles, the Four Tops, Martha & the VANDELLAS, Billy Stewart, and Chuck Jackson. They were one of the top regional bands in the Carolinas, right into the second half of the 1960s, and also managed to cut at least one record, "Nobody" for the JCP label, that fetches a huge amount of money in collectors' circles in the 21st century. They moved from strength to strength as personnel came and went, sometimes voluntarily, and other times due to the exigencies of the Vietnam War. By the end of the 1960s, while maintaining a remarkably consistent sound (and some players returning after getting out of uniform), the Cavaliers merged with another Dunn band, the Tymes, and adopted the name Men of Distinction, evolving into a larger, more imposing "power show band." Christened the Men, with a horn section similar to Blood, Sweat & Tears (Mark II) and Chicago, they were compared to those outfits, and later also compared to Tower of Power and Earth, Wind & Fire. But they never abandoned their soul roots, only making the sound bigger and better. They played into the '80s before the members began drifting away into other lines of work, necessitated by marriage, responsibility, etc. The Men of Distinction, a dozen strong, reunited for one show in December of 1996 on the occasion of Harry Driver's 65th birthday, to fulfill his wish to see them perform one last time . The show was so successful and satisfying, that the members -- despite all of them having regular jobs and careers -- decided to keep their work together going in a series of special-occasion performances, taking the name Harry's Band in honor of their manager, who passed away from a heart attack in 1998. The group continued working into the first decade of the 21st century before calling it quits, but they were sufficiently well-known in the Carolinas to release a live double-CD set, and they maintain an active website.